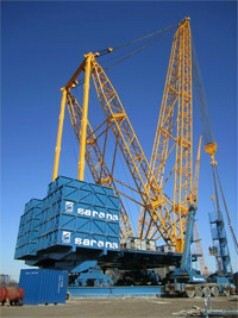 Follow up project due to the excellent handling of the first mobile crane with secondary control 2010. 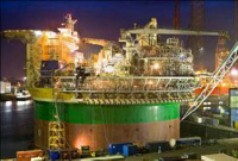 The SHS is used for the installation and recovery of sub sea oil production modules in an operation depth down to 320 m.
Download more information about SHS. Load Test Bench for three test axes for the testing of Rineer vane motors up to series 125 with 4096 cm3 displacement. 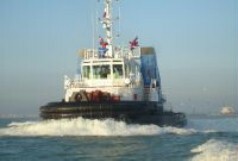 The main winch and the auxiliary winch use the same pressure controlled primary station and reduce the installed power. The operation radius can range up to 130 m. At 100 m operation radius loads can be lifted > 600 t.
Secondary controlled drive, automated transport operation, position determination via sensors in the road bed. High positioning accuracy. 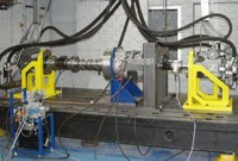 Dynamic coupling test bench, consideration of the torsion angle of both coupling halves, energy recovery via the load unit. 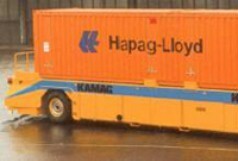 The required acceleration power of 530 kW can be lowered to only 30 kW primary power due to the use of hydraulic accumulators. 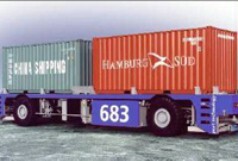 More than 200 vehicles in use at the container terminals in Rotterdam and Hamburg. Position determination via sensors in the road bed. For 3000 kW acceleration power only 800 kW primary power required. Up to 60% of the energy is recovered. 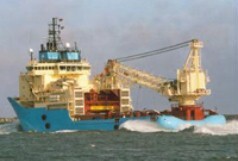 The ship pulls a plough, opens the sea bed, lays the cable in and closes the trench. The high dynamic of the secondary controlled system prevents the break away of the plough rope while get stuck. 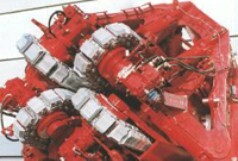 Up to 16” rigid or flexible pipelines are lowered to a depth of 2500 m with the help of two series-connected tensioners. Secondary controlled drives work together with conventional hydrostatic drives in a single system. While the conventional hydrostatic drive carries out the lifting function, the superposed secondary controlled drives perform the active heave compensation. Conventional winch systems with their heavy steel ropes reach their limits at depths greater than 2500 m. Synthetic fibre ropes, however, are lighter, although more difficult to handle due to their stretching. With the aid of six secondary controlled drives this problem has been solved successfully for the first time. 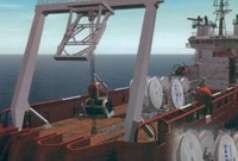 Both mounted cranes are used for transferring relief supplies on and off cargo ships. 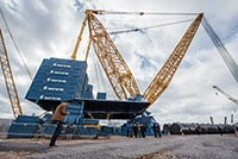 Without the active heave compensation loading and unloading would be impossible. 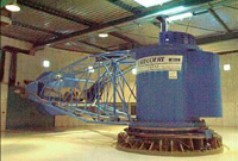 The hoist gear is solely secondary controlled. 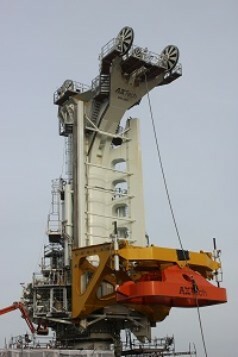 The slewing gear is also secondary controlled but is additionally supported by a conventional hydraulic rotating drive. 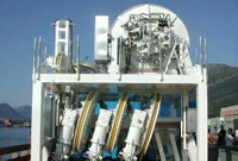 The secondary controlled winch drive lowers the supply unit with the underwater robot (ROV) to the sea bed. 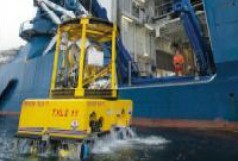 In active heave compensation mode the ROV undocks and can be remotely controlled for maintenance or monitoring operations. The integration into an existing hydraulic supply system on board is a cost-effective alternative to conventional bow thruster systems. 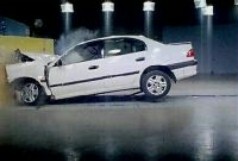 The power limitation of the secondary controlled drive allows maximum utilization of the primary station. 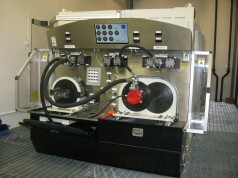 The test bench can be operated at 160 kW from both drive and load sides. The variety of configuration possibilities enables a multitude of tests to be carried out, ranging from component tests right through to efficiency measurement tests of complete systems. 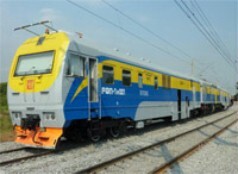 The rail milling machine will be used for the maintenance reprofilinig of rails. For this the complete rail milling machine must be driven in speed synchronisation.